KARACHI: “We are on our toes and this fight is going to in our home,” Pakistan’s shinning Mixed Martial Arts (MMA) star Uloomi Karim Shaheen gushed as he spoke about his upcoming fight against Philippine’s Jeremy Pacatiw as the country will host the 17th edition of Brave Combat Federation event on October 27 at the Nishtar Park Sports Complex in Lahore. 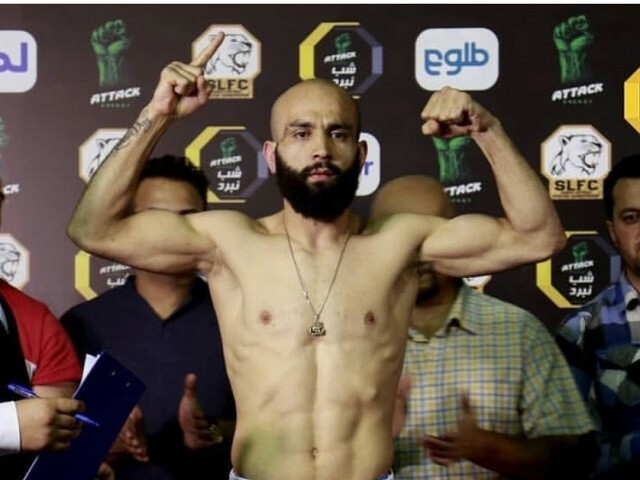 The 27-year-old will take on Pacatiw in the bantamweight bout in a co-main event, which is going to be a first of its kind as most of Pakistani Mixed Martial Arts (MMA) stars have to go abroad to fight, while it is a step forward for the country’s fastest growing sport. He said that before the fight the training is in full-swing and he would want to take the opportunity to win at home in front of the home crowd. Uloomi trains in Islamabad and he believes that before any event it is the preparation that counts, as he would increase the intensity of the training and the focus would be more on the cardio and conditioning, stretching to four to six hours a day, six days a week. “The training camps are different before the fight and we up the pace two to three notches,” said Uloomi. Uloomi had lost his last bout against Afghanistan’s Emran Tarakhil in August and the youngsters is hungry for the win, while Pacatiw, who represents Team Lakay, will be riding on his last success against Keith Lee that too was in August. Ullomi’s has seven wins and four defeats under his belt, while Pacatiw has seven wins and three defeats to his credit, neither have played a draw in any of the fights. Meanwhile, besides Uloomi’s bout, the other co-main event is between Brazil’s Rodrigo Cavalheiro and French fighter Abdoul Abdouraguimov. But for Pakistanis, the event is sending out a message that there are more avenues for them and Uloomi encourages aspiring MMA fighters to continue and the doors of his training facility are open to all. “Our doors are always open for other fighters coming to us, coming to have their training camp, and we share the knowledge here. There is a reason why we are the best, they can take whatever they can from us to grow,” said Uloomi. On the other hand, he pointed out that other three fighters from Fight Fortress including Haider Farman, who was a pathway for Team Fight Fortress to the Brave Combat Federation events, is hoping to look for a win as well. Farman has competed twice with the federation before. The other two fighters are Najam Khan, who is known to be the knock-out artist, with Zia Mashwani, both of whom have an undefeated record so far. Farman will take on another Filipino Ariel Oliveros in strawweight. Najam will have another Afghanistan opponent in the form of Mohammad Wasim in welterweight, while Mashwani will face off against China’s Yibugele in featherweight. Other Pakistani fighters include Mehmoosh Reza who will fight Phillipines’ Arben Escayo in featherweight. In other fights, Egyptian lightweight superstar Ahmed Amir will face New Zealand’s John Brewin Jr, Ireland’s Frans Mlambo will be looking for a win against Wales’ Aidan James, South African JP Buys takes on Russia’s Gamzat Magomedov, whereas Abbas Khan from the Bahraini national team, who trains at KHK MMA Bahrain, will compete in the opening bout of the night in an amateur fight against Sikandar Badar. Brave Combat Federation is an initiative held under the patronage of His Highness Sheikh Khalid bin Hamadal Khalifa. Brave 17 is the first International mixed martial arts event to be held in Pakistan. Athletes representing 12 nations are confirmed to compete in Pakistan. Brave 17 will aim to become the most aired combat sports event to take place in history of sports in Pakistan, according to the organisers.